Kavar was a Jedi Master and member of the Jedi High Council during the Mandalorian Wars and Jedi Civil War. He was also close friends with the Jedi Exile, who learned under him as an informal Padawan prior to the Mandalorian Wars. From conversations between Kavar and the Jedi Exile, it is known that she received some degree of training under the Jedi Master; however, Kavar specifically states that she was not his Padawan. 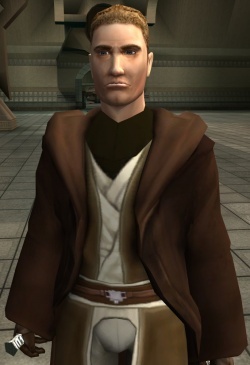 If the player has set the Exile to the dark side, they will side with General Vaklu. The Exile will then battle against Kavar, who will be surprised to see his former friend fallen so far. 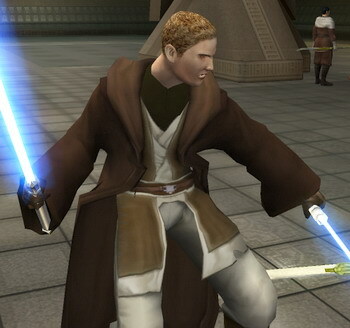 As a result, the player is forced to kill Kavar, resulting in his absence on Dantooine. Should the Exile support Talia, there is still a chance to kill Kavar in the Enclave if the Exile killed either of the other Masters, Vrook or Zez-Kai Ell. In cut content of the game, Kreia has more dialogue for the Masters after she drains them of the Force. They do not die instantly; instead, Kreia Force Crushes or Force Chokes them. Kreia will ask Kavar if, during his stay on Onderon, he had felt what had taken place on its moon Dxun. Little is known about Kavar's early life. It is possible that he fought in the Great Sith War. It is also known that, at some point, he informally trained a Jedi who would eventually become known as the Jedi Exile. He would become good friends with her at some point. At the beginning of the Mandalorian Wars, Kavar was involved in skirmishes against the Mandalorians. The Mandalorians came to believe that Kavar, the "famed Jedi Guardian", would be placed in command of the Republic's overall war effort once the Jedi entered the war. However, the Council chose to remain neutral throughout the conflict, and it was Jedi Knights Revan and Malak who led a force of rebellious Jedi in their place. Many among the Mandalorian survivors often wondered how differently the war would have gone had Master Kavar, not Revan, been leading the Jedi during those fateful years. After the war with the Mandalorians was over, the High Council judged the Exile for joining Revan in his crusade against the Mandalorians. The Council chose to banish her, but not because she followed Revan. They sensed that she was a wound in the Force, and were afraid of what might happen if she remained in the Order. 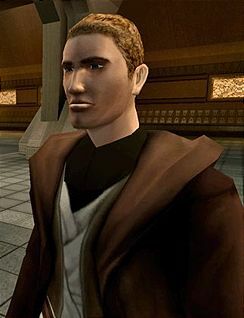 Little information is known about Kavar during the Jedi Civil War except that he fought alongside the Jedi ranks against the forces of Darth Malak. He was presumed dead at some point during these events, but that was far from the truth. 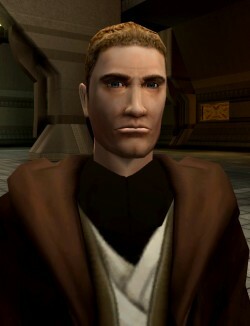 After the Jedi Civil War, Kavar went to Onderon and became the advisor of Queen Talia. He would stay in the shadows of the Royal Palace, but when he did speak, he was described as being "cryptic as hell." As tensions rose between Queen Talia and her cousin, General Vaklu, Kavar urged Talia to wait until the true threat, Vaklu's unseen supporters, showed itself. When the Ebon Hawk attempted to land in Iziz, Vaklu's forces under Colonel Tobin's command fired upon it, sparking a dogfight between Onderonian forces and the Republic and creating more tension in the city. Through the alliance of the Mandalorians on Dxun, the captain of the Ebon Hawk, known as the Exile, made arrangements through a doctor named Dhagon Ghent to meet Kavar. Kavar met with the Exile in the Iziz Cantina. Just as the Exile was to learn the full circumstances behind her trial, Tobin's forces showed up and opened fire in the cantina. Kavar stunned Tobin's men and escaped to the palace, while the Exile was forced to fight her way through several troops back to her ship. As he ran, Kavar told the Exile that he would get word to her when he was able. Not too long after these events, Kavar sent a message to the Mandalorian Kelborn, telling him to contact the Exile and tell her that he had arranged safe passage for her back to Onderon. But the Exile got the message too late: the Council of Lords, under the influence of General Vaklu, decreed that Talia was guilty of treason soon after the message was sent. With the Onderonian military divided between support for Talia and Vaklu, the Onderon Civil War began and passage to the planet was no longer safe. When the Exile heard the message, she rushed back to Dxun and enlisted the aid of the Mandalorians there. She then used a Basilisk War Droid to reach Onderon. While the Exile made her way to the palace, Kavar and a group of troops fought at the palace gates against Vaklu's supporters, the Sith and their beasts. Kavar was forced to retreat inside the palace, where he coordinated the battle. The Exile eventually reached Kavar, and he directed her to Captain Kadron. When the Exile made it to the throne room, Kavar rushed in and eliminated some of Vaklu's troops. He stayed back, however, when Talia and the Exile fought Vaklu themselves. He would also remain quiet when Talia decreed that Vaklu was to be executed. However, at the Exile's request, Talia gave Vaklu a fair trial. The short but devastating civil war was ended, with Onderon's rightful ruler still on the throne. Kavar answered the Exile's questions, but was shocked to learn that Atris survived the attack on Katarr, not knowing that she had never attended the fateful conclave. He agreed to join the Council on Dantooine after the Exile had gathered all of the remaining Jedi Masters. Once the Exile had done so, he met with fellow Masters Vrook Lamar and Zez-Kai Ell at the rebuilt Jedi Enclave, and encountered the Exile for what would be the last time. The Council decided that it was time the Exile knew the truth, and told her everything: she was a wound in the Force, she had cut herself off from the Force. All three of them found it necessary to rid the Exile of the Force, fearing she was a threat to life itself. However, as they were about to cut the Exile's ties to the Force, Kreia, whom Kavar and the other masters had previously believed to be dead, entered. After presenting herself, Kreia decided to make the three Jedi "see the Force through the eyes of the Exile" and killed them with an extreme version of Force drain leaving them dead and drained of the Force. Kavar practiced Jar'Kai variants of the lightsaber combat forms Ataru, Shien, Niman, and Juyo. He fought using two blue lightsabers—one regular lightsaber in his right hand, and a shoto in his left. In his first meeting with the Exile on Onderon, he was carrying only his regular saber with him. He could also use sever force ability which he used on the exile. Kavar was a master of the advanced Force forms, and was so proficient in using Force Stun that he could stun multiple targets simultaneously. He was capable of using Force wave against enemies, and also used the Jedi healing ability.